This is the second light of this model I have purchased. I like the size and shape of this light as it mounts easily on my bike and I can also carry it when I go running, as it is lightweight and fits in my palm of my hand. The only downfall is that it sometimes falls out of the mount when I cross train tracks or cracks in the road. However, I've run it over at least twice and it's still going strong. It is very light in weight, has an easily adjustable position, and shines brightly. It is my primary bicycle headlamp for night riding and commuting. The mount is easy to install and move around (careful how close you clip the ratchet tab) and the light is bigger than some, but is sturdy and extremely bright. The flash function makes sure you're seen from a long way off. I like the ability to change batteries rather than charge, as well. 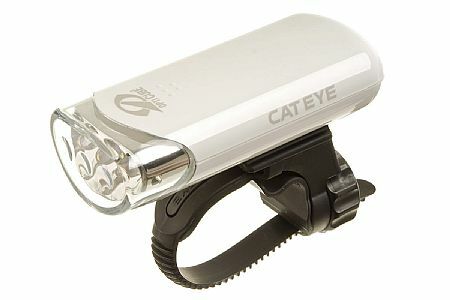 This bike light was bought to be used for Norseman Extreme Triathlon as s front and back light was required for the course. The light is excellent, small, light weight ad very easy to mount and dismount from the bike. It also gave ample light for he tunnel crossings that I had to do. Highly recommended product! I highly recomend this light. Great for the price and uses common size battery. Ride mostly during the day. Easy to mount and swap from bikes. Got these lights for a week long cycling tour where rechargeable lights would be impractical. The batteries lasted the whole week, despite 5-6 hours ride time per day. They are not as practical as rechargeable as batteries can be expensive. Unit takes AA batteries. This battery operated light is quite efficient,especially for the money. Two of us are using them! I love this little light!! When I see the reflections from a stop sin a block away I know that I can be seen, which is very important to me. Of course I only use the flashing mode, it is adequate for riding in the inky black of rural areas as well as for being seen in the suburbs. It also reflects off the handlebars of bikes coming my way. I can see them half a block away. Unfotunately one pair of cheap batteries leaked and now I need to replace it because the insides are not sealed at all. Next time I will be more careful. But that non-sealed system did always let rain dry out., so it is OK for that. But I always park my bike in the garage, never outside in the rain. I do wish that I could purchase just the light, the mount is still perfect, only the light died. SUFFICIENT FOR RECREATIONAL BIKE RIDE. Over-all...Good price, compact & easy to remove. Great light for peanuts! It stays put on the handlebar. A little on the heavy side. If you need a head light for almost nothing this is the one to get. I got my 1st one on a raffle and liked it. I read a review while looking for another and decided to get two more when they were on sale. Just make sure you get on a schedule to change the batteries so you don't run out or light too low hen on the road. What you have to understand is your not going to get a huge beam of light on the ground with this light. This light is not a 600 lumen light. However you will get an extremely bright light that gets attention. The flash mode is very very bright. Mounting is rock solid and very easy to adjust light direction. Battery life is not as good as I would like. However, still lasts about twenty hours on flash mode. I purchased the white model. The white looks great in contrast with the dark blue frame on my bike. This is a very bright light that has good battery life. It is quite a lot brighter than last years model. The strap is very secure and works well even on bumpy roads. It looks nice and has a high quality feel to it. Very good value.